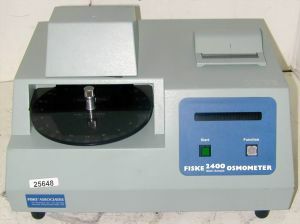 Product Description The Fiske 2400 Multi-Sample osmometer gives you freezing-point technology, automated sample handling for up to 20 samples and requires only a 20uL sample size. This valuable clinical tool provides your laboratory with multiple functions: toxin screening, osmotically-active concentration monitoring, hyponatremia evaluation, and urine and stool analysis. A test sequence can be interrupted to run a stat sample without affecting the ongoing process. The Fiske 2400 Multi-Sample Osmometer tests up to 20 samples without supervision, allowing your valuable personnel to concentrate on other tasks. With the push of a button, all calibration adjustments are made by the onboard microprocessor.